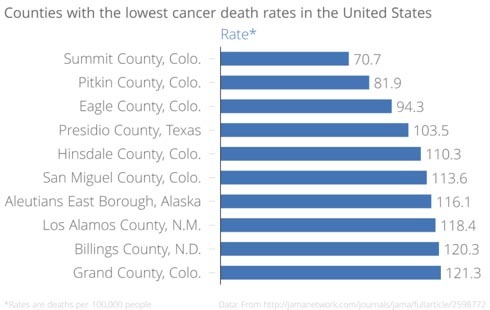 An extensive study published by the Journal of the American Medical Association found that Summit County, Colorado has had the lowest cancer mortality rate in the nation for more than 30 years. Summit County had the lowest cancer mortality rates in the country in 1980, and still did in 2014 according to this new study. 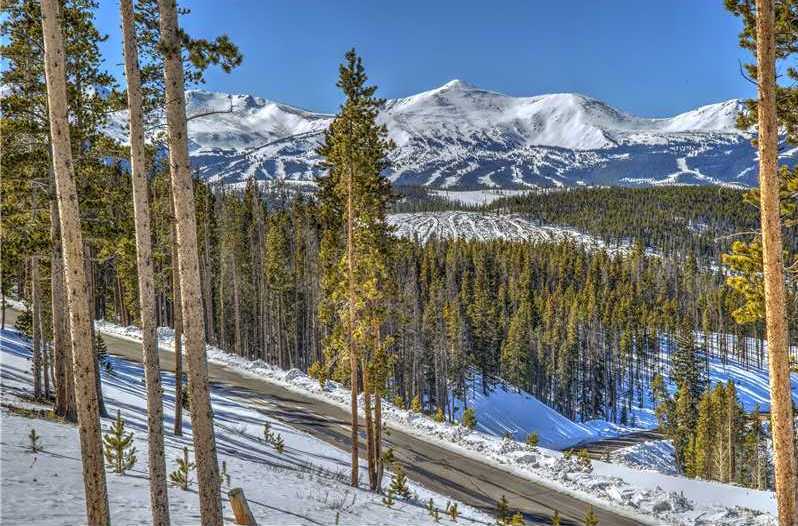 Known for our beautiful ski resorts and high mountain peaks, Summit County also ranks no worse than third nationally in any of the study’s list of counties with the lowest death rates for 10 specific kinds of cancer. 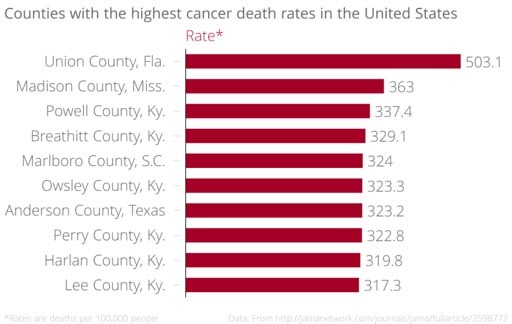 In comparison, the nation’s highest cancer mortality death rate occurred in Kentucky and areas of the South. The study provides further evidence that where you live can help determine how healthily you live. People living in the high-country are very active on a daily basis, typically don’t smoke cigarettes and eat a healthy diet. This follows the national trend of cancer deaths being less common in areas that have lower rates of smoking and obesity as well as places where people eat a better diet. Previous studies have shown that a place’s culture, affluence, climate and infrastructure can all affect a person’s well-being. Income is also believed to play a role. This new report is exciting but not that surprising as Colorado’s ski counties have long been among the healthiest in the nation. Last year a report found that residents living in central Colorado have among the nation’s lowest rates of death from cardiovascular disease, diabetes, neurological disorders, chronic respiratory diseases and common infectious diseases. This is all great news for people living in the mountains of Colorado but nationwide, the trend is not like that of Colorado’s high country residents. Summit County’s overall cancer death rates have dropped by nearly 50 percent since 1980. The nation as a whole however has seen a smaller decline. Nationwide death rates have risen nearly 50 percent in parts of the country that have high rates of smoking and obesity and are also relatively poor.